Howard Chandler Christy (1873-1952) was a well-known American illustrator, famous for his popular depictions of idealized, beautiful women. During World War I, these so-called "Christy Girls" appeared on various World War I posters. The poster seen here entitled, "Fight or Buy Bonds," is currently on view in "Fight, Save, Buy, Wake Up! : World War I Posters" at the National Heritage Museum. How did this image of the "Christy Girl" evolve? According to one historian, the first image of a "Christy Girl" appeared in an 1895 issue of The Century magazine. It was probably while Chirsty was a student at the National Academy of Design in New York that he got the commission. By then he had attended the Art Student League and studied under William Merritt Chase(1849-1916). Another early image of a "Christy Girl" was published in Scribner's magazine in 1898, entitled, "The Soldier's Dream," and portrayed a beautiful girl. Some critics claim that this was the first known "Christy Girl" image. Like the "Gibson Girl," the image of the "Christy Girl" was an idealized vision of American femininity in the 1890s. This ideal was comprised of high breeding aristocracy, and daintiness. In addition to magazine illustrations, Christy also illustrated books. In 1906, both The Christy Girl and The American Girl were published. These two popular books helped solidify Christy's reputation and spread his idealized image of an American woman. By 1915, Christy was in New York working on magazine commissions. When World War I began, he rallied his talents around the war effort painting posters for government war bonds, the Red Cross, Navy, marines, and civilian volunteer groups. Among his most popular posters were the "Spirit of America" and "Gee! I Wish I Were a Man I'd Join the Navy." These two posters feature images of the "Christy Girl" in very different garb. 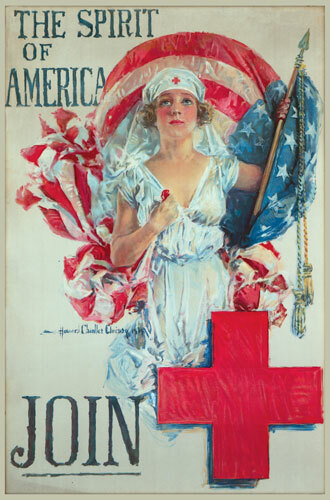 The Red Cross nurse is - like the woman in the "Fight or Buy Bonds" poster at the top of this post - depicted as a sort of allegorical figure of America robed in Neo-Classical dress. In contrast, the young woman in the Navy poster is shown wearing a Navy uniform. Fight or Buy Bonds, 1917, Howard Chandler Christy, Printed by the Forbes Company, Boston, National Heritage Museum, Van Gorden-Williams Library & Archives, Gift of H. Brian Holland, A96/089/06.